All users are expected to abide by the University’s Computer Use Policy, and the Library Code of Conduct. The user accepts and assumes all financial responsibility for the cost of repair or replacement in the event of loss due to theft, damage, negligence or misuse. Charges for missing parts will be levied. Suspension of borrowing privileges will also apply. Borrowing privileges will be suspended if the equipment is not returned or repeatedly returned late. A repair fee will be assessed and levied for damaged items or parts. Any equipment malfunction, missing parts or damage should be reported immediately to the staff. 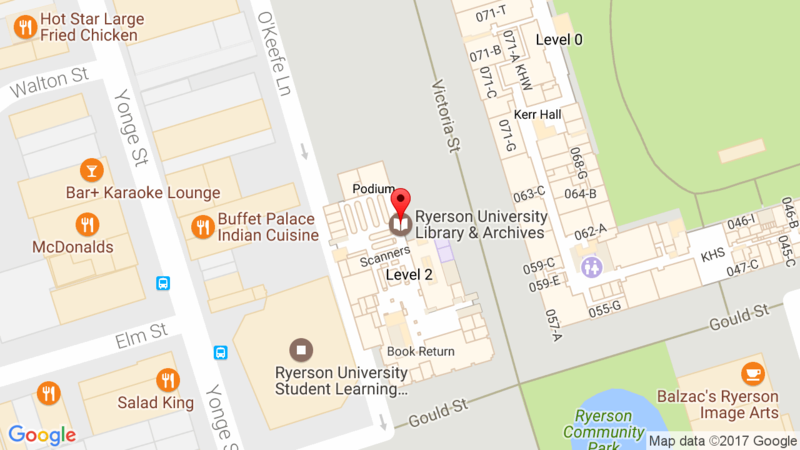 All Ryerson University currently enrolled students, both part-time and full-time, Faculty, Staff, and Continuing Education students with a valid library card may borrow the equipment. Users must also be in good standing with the Library, i.e. no outstanding fines or liabilities over $20. Students, Faculty, and Staff with a Ryerson OneCard will be asked to verify their identity with a piece of government-issued ID, or letter from the University or utility bill. Continuing Education students without a Ryerson OneCard will be asked to verify their identity with a piece of government-issued photo ID with their name and address, e.g., driver’s license, AND/OR a utility bill, e.g., phone bill, with their library card. In addition, proof of their student status will be required, e.g., fees statement, enrollment form. First-time user will be required to read, sign and submit a DME Technology Equipment Lending Agreement Form and come to the Library Circulation Desk to complete registration. DME equipment are available for loan from DME Lab located on the third floor of SLC (SLC308) during its hours of operation. The loan periods for the equipment are all 48 hours. The equipment is available for loan on a first-come, first-served basis. Eligible patron can borrow one item at a time. Renewal, advance bookings and holds are not available. Overdue fine for each item is $10 per hour. Always check the receipt for due date/time. The user assumes full financial responsibility. Borrowing privileges will also be suspended if the item is not returned or repeatedly returned late. Any equipment malfunction, missing parts or damage should be reported immediately to the staff. Replacement charges for lost items range from $100 to $1080 depending on the cost of actual item. A processing fee of $10 will also be levied. A repair fee will be assessed and levied for damaged items or parts. The user is responsible for checking the receipt for due date/time and returning the item in person to DME on time during its Operating Hours. The user will be required to wait momentarily for staff to verify that the items have been returned intact.